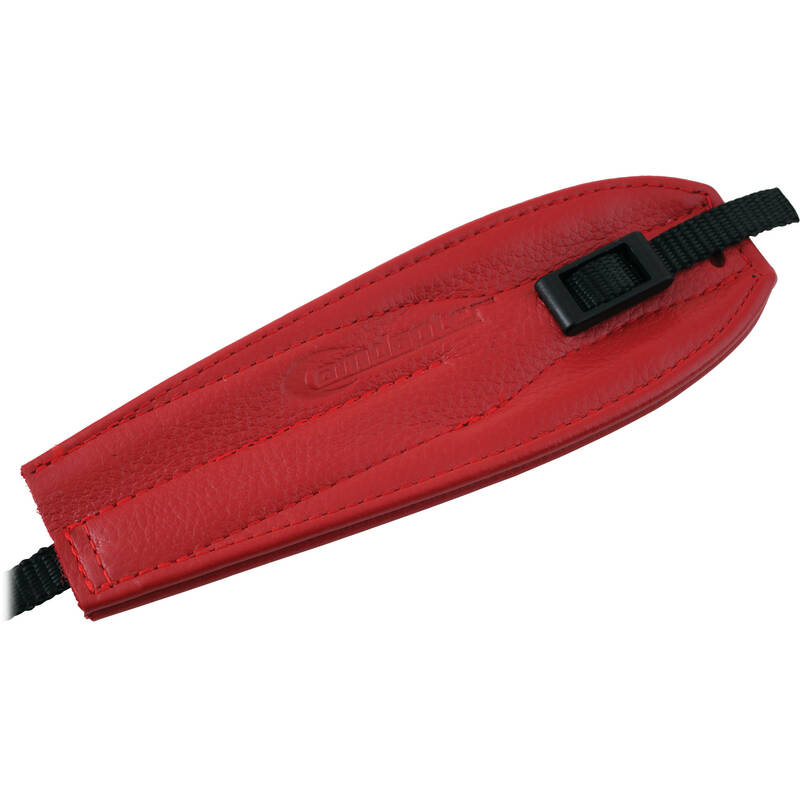 The red Pro Strap from Camdapter is made from top grain leather and is soft and comfortable. It fits into your camera easily and stays in place once you've adjusted it to your hand. It's bolstered by heavy-duty nylon thread and is made from one continuous piece of rugged 3/8" nylon webbing. For added safety, it has a built-in slip lock that holds the strap in position. The Pro Strap is designed to fit into the lug on the bottom of your camera. It is fully adjustable and can be used in conjunction with Camdapter's optional Camera Adapters. It is designed to be used with pro DSLRs with battery grips installed. Box Dimensions (LxWxH) 11.0 x 3.0 x 0.4"
Pro Strap (Red) is rated 4.4 out of 5 by 38. Rated 5 out of 5 by Jake from Great hand strap! Just purchased and quickly came to love this hand strap! I am a professional wedding photographer and used it on my camera yesterday for the first time. 10 hour wedding day, lots of lens changes, and the strap performed as I had hoped it would. As a wedding pro, I have been wanting to slim down how much equipment hangs off of my body and getting the neck strap off my camera was a priority for me. Shooting with just the hand strap yesterday was great! I felt more mobile than ever and didn't have to fuss around with a dangling neck strap. The strap itself is very durable. Seems to be high quality leather and soft enough on first-use to not irritate my hand. Performance-wise, I think what I am happiest with is the locking buckle design...once I sized it to my hand, the buckle locked the strap in place and did not budge at all after a long day of shooting and meaneuvering. Very pleased and would recommend. Rated 3 out of 5 by Matt D. from Well made but does not work with smaller cameras If this item worked with my newest camera (Sony A7SII) it would get 5 stars, the problem is you either need a specialized adapter or its for a camera such as the Nikon D-4 or full sized Canon's. The problem is it is too large, even at its smallest setting you'd need massive hands for it to work correctly. It appears to be great construction with good quality leather. Too bad I was unable to actually use it. Rated 5 out of 5 by Michael from Hate neck straps? Try this! I hate neck straps. This is the second pro strap I've bought. I have three bodies, the first body has a hand strap that isn't make any longer. I looked long and hard for a substitute. The Pro Strap turned out to be that substitute. Both my other bodies now have this strap. Almost the first thing I purchased when I bought my last body. Attaches to my L-bracket. Allows me to hand carry the camera safely and securely. Easily adjustable for gloves in the winter and bare hands in the summer. Works well with the over-the-shoulder brand strap I use. Never in the way when mounting the camera on a tripod. There may be other hand straps out there, but this one works. They have other colors but basic black keeps a lower profile. Well worth the money. Rated 5 out of 5 by Greg S. from Goodbye Pain in the neck The Pro Strap by Camdapter is one of the best investment I have made in my photographic equipment. Easy to install and much more practical than a neck strap. The Pro Stap allows you to hold your camera in your hand with total control. No more camera swinging around uncontrollably around your neck expecially in crowded or confined spaces. It is a real joy to use. Should have purchased it a long time ago. Rated 3 out of 5 by Eric from DSLRs need the bottom adapter, it's not included I received the strap but couldn't connect it to my D750 because the "optional" adapter was not included in the package. It's not optional, it's required, and I'm annoyed that B&H doesn't sell the complete kit (Camdapter makes one) or link to the necessary item in the strap's product description. So I'll buy the separate part, and then it'll probably be a nice ?strap. Rated 5 out of 5 by Frank from Great Strap...Great Price I wanted to rid myself completely of a neckstrap. So, I recently invested in a Carry Speed Sling and Spider Pro carry system. But, I still hold my camera (Canon 60D) in hand for lengths of time. This strap was a stylish and comfortable solution. Since it attached to the grip section only, it allows me to still use the Carry Speed or Spider systems since they attach the the 1/4 inch thread at the bottom of the camera. I have my camera outfitted with a battery grip, as well, and that poses no problem at all when it comes to the strap's fit. Installation was not difficult, but it does require that you follow the directions carefully! DO NOT PULL OUT OR THROW AWAY THAT STRAW. At first you may think it is for packing and shipping but it actually is a tool used for the strap's installation. Rated 2 out of 5 by John from Very well made, but not for me I needed some help with my heavy camera setup as I suffer from tendinitis. This strap is very well made - nice quality leather. However, with my small hands, it just gets in the way and, for my situation, offers no real support. Also it cramps my shutter finger as the strap forces my hand nearer to the camera body my finger has to move a bit to the right before I can fire the shutter. It really slowed me down so I removed it. I'll probably pass it on to someone with bigger hands. Will this work with a Fuji X-Pro2? Thank you. As the Fujifilm X-Pro2 does not have a lug on the bottom, you would need to use one of the Camdapter Adapters. Though, the strap might still be a bit long as it is designed for use with a DSLR with a grip. do i need an adapter for the nikon d750? It depends if you have a quick release tripod mount attached and which one. Some, like Kirk, have an nice attachment point, so you don't need anything else.